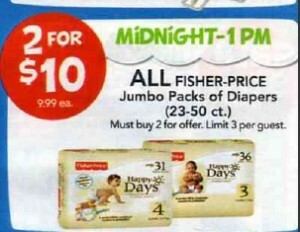 Great Black Friday Deal on Fisher Price Diapers - $3.00 a Pack! Great Black Friday Deal on Fisher Price Diapers – $3.00 a Pack! Charlene with My Frugal Adventures passed along a great deal to me today! On Black Friday at Toys R Us and Babies R Us (November 27th), you can get Fisher Price Diapers for 2/$10.00 (must buy 2 to get the deal). If you print this coupon for $2.00/1, you can save even more! The limit is 3 offers per guest (6 packages). These diaper packages seem to have lots of great coupons hidden inside of them, so be sure to check it out.